We understand that visits to the veterinarian can feel like a huge ordeal to cat owners, and it oftentimes starts at home with the cat carrier being pulled from storage and…where did Kitty go? Stress only goes up from there, with “the chase” of searching the house for your cat, wrangling them into their carrier, taking them out into an unfamiliar environment–smells, noises, strangers!–and then of course the appointment itself. But this stress can be reduced SO MUCH just by going back to that first point: the cat carrier. 1) Familiarity and comfort with the cat carrier. 2) Security while in the carrier. 3) Ease of handling while in the carrier. And I promise you – it will be easier than you think! I am going to ask you to do something strange, but bear with me. I need you to make your cat’s carrier a piece of furniture in your home; don’t tuck it away in a closet, hide it in the garage, or leave it in a shed until it’s needed. If your cat never sees their carrier, then they certainly don’t view it as a safe space; they may very well view it as “the thing that the humans put me in when bad things happen”. If you make the cat carrier the opposite, then, over time, they will have a better perception of it. One of my cats’ carriers lives in my living room, tucked under an end table – it’s hidden enough not to clash with the decor, but plenty accessible to the cats who will willingly nap in it sometimes. There is a small blanket in the carrier that gets more and more filled with their scent as they hang out in it on a regular basis. The appeal can be levelled up by leaving treats, or even feeding meals, inside of the carrier. By making these few small changes, the cat carrier becomes a fun place where good things happen. Some cats will adapt to this much quicker than others, so patience is important, but the change in perception WILL happen! Covered – The ability to see what is going on outside of a cat’s carrier can be a source of anxiety. There are many frightening things lurking (such as dogs in a waiting room), and nowhere to run. Cats much prefer to be in a state of “if I can’t see them, they can’t see me”. Placing a blanket or towel over a cat’s carrier can create a secure hiding place when in strange environments. If you don’t have one handy, ask the reception staff at your veterinary clinic, and they should be glad to find one to help your kitty feel safe. Secure – Carriers come in all sorts of shapes, sizes, and materials…so what makes a carrier physically secure? Carriers must be able to be closed securely on all sides, which is why commercial carriers are preferred over cardboard boxes or baskets. While carriers with mesh windows are nice for limiting a cat’s view of the outside world, claws can very often snag on mesh siding, which can induce panic or injury. 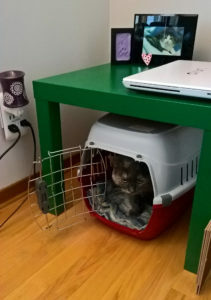 One of my kitties was placed in a fabric carrier with mesh windows for his twelve-hour drive from Montreal to Dartmouth, and at about the four-hour mark he managed to tear a hole in the mesh and escape into the cargo van – talk about a stressful event for everyone involved! 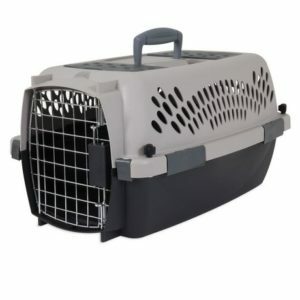 Solid and Sturdy – In addition to preventing escape opportunities, commercial plastic cat carriers are a preferable option because they hold their shape. There is a helpless feeling that comes from being unable to get your footing. Even by holding our cat securely in our arms in a cloth carrier, every point of contact is restricting their space by pressing in on such a carrier’s sides. With plastic carriers, you can securely gather the carrier in your arms to prevent bumps and swaying, whereas doing the same thing with a cloth carrier will squeeze in on your cat and affect their space. Manageably Sized? – This somewhat goes hand-in-hand with the previous point. Large carriers are a huge asset for long distance travels, as you can set them up like a little condo for the drive, with food and water and litter and a space to nap. For a visit to the vet? They are a bit cumbersome. With large carriers, there is also a temptation to fit multiple adult cats in one carrier. Even the best buddies at home can get overwhelmed by losing their ability to be alone (I’d say that kittens are the exception to this), so keeping cats in separate carriers if they are travelling on the same day will help to improve their experience. Accessible – This point is so important that it will get its own section soon. For now, I’ll stick to the basics and say that the ability to access a cat through a larger entry than the carrier door is priceless. This could be a door at the top of the carrier, a top half of a carrier than can easily be undone, or a side half that can be unzipped. When we have access like this, it allows us to avoid “wrangling” cats (i.e. reaching in and forcing them out of their carrier) in favour of handling cats. I told a colleague recently that if I was president of the world, my first order of business would be banning all cat carriers that cannot be easily undone! From the perspective of veterinary staff, being able to reach your cat easily is so important, as this is your cat’s first impression of us. When carriers cannot be disassembled or open from the top or side, this first impression will be a set of strange hands reaching in and yanking them out of their secure space, getting caught on doorways, being awkwardly pressed against the sides of the carrier during the wrestling match to pull them into some unfamiliar room… We can’t blame a cat for being grumpy when this is their experience with us. Conversely, this first impression is so improved when a carrier can be disassembled, and we can approach your cat in a less invasive way. If the top half of a carrier can be unclipped and removed, exams can even be done without removing your cat from the carrier at all! Even if you expect your kitty to lash out, having a carrier that can be taken apart allows us to use towel wrapping, which is a handling technique favoured by low-stress and cat-friendly practices. Accessibility is priceless for allowing all cats to get the most out of a veterinary visit, while experiencing the least amount of stress. We know that sometimes clips or screws can go missing, and the solution that comes to mind is to replace them with something secure like a zip tie, but this takes away the accessibility offered by this style of carrier. I’ve seen people use other means of adding security like bungee cords, which can be easily removed and let us take advantage of a carrier’s construction; even tying a string through holes left empty by a missing screw can add security while leaving a carrier accessible. For cat friendly handling, these removable Macgyvering techniques are much preferred. If you’re reading this and thinking that it might be time to upgrade your cat carrier, the good news is that there is no shortage of options out there. You can go onto Amazon.ca or visit Walmart and find carriers with the qualities I have written about that are easy on the budget. Whether you are picking up a new carrier or reevaluating the one you already have, please remember my plea to make your cat familiar with their carrier. They might never say “thank you”, but the reduced stress of travel and vet visits will be a cause for thanks for everyone.